The fans tried to take selfies with the 8-year-old boy, which they would post on social media with the trending hashtag "fake smile boy." Noticing the camera, Gavin automatically put on his world-famous grin. The iconic smile has made Gavin a global internet meme in recent years. In China, he gained 2.2 million followers on China's Twitter-like Sina Weibo in six months. It was Gavin's second time to China, following his first visit last summer to Beijing and Chengdu, in Southwest China's Sichuan Province. This time, at a nighttime festival, Gavin became the most popular star as many Chinese celebrities sought him out for selfies. But a picture of Gavin falling asleep at the festival also went viral on the internet, sparking discussion. Many netizens worried that the boy had become overexposed and that his childhood would be affected. Gavin, accompanied by his mother and Chinese agent, was at a fan meeting at the Sina headquarters in a Beijing suburb at noon on January 11. He wore his big famous smile along with a scarlet hoodie emblazoned with the Chinese characters for "prosperity and peace," a traditional phrase describing an ideal life. Hundreds of fans attended the meeting, some of them having won their tickets through a competition in which they posted photos mimicking Gavin's iconic expressions on Weibo. Gavin was led by the host to a seat, but was soon asked to stand up to teach fans his freestyle dance. In a game that followed, several fans were invited to the stage to mimic Gavin's famous expressions. The winner was eligible for a gift from the organizer as well as the privilege of taking a selfie with Gavin - of course, all with his famous grin. In the end, Gavin was awarded two prizes, one from Sina to celebrate his Weibo account gaining one million followers in one day, and the other from Panda Guardian, a public welfare project, naming him an "overseas ambassador." Holding the certificates, the boy gave the camera his widest grin. The second grader from Minnesota garnered his first taste of online fame in 2013, when his uncle Nick Mastodon, a Vine star, began to post video clips of Gavin on the short video platform. In the following years, memes made from Gavin's pictures and videos, featuring his expressive faces, went viral on the internet. Gavin's popularity also stormed the Chinese internet, making him a golden boy of memes in China, together with Song Min-guk, son of Korean actor Song Il-kook, who became well-known in a show with his two triplet brothers. CNN quoted Ding Yan, founder and CEO of Dongtu.com, as saying that GIFs of Gavin's awkward smile "might be used as many as 10 million times a day across China's various social media platforms." Chinese netizens described Gavin's smile as "embarrassed but polite," "terrified but elegant," "forced to be happy" and "officially fake." Products featuring Gavin's smile have become hot sellers on his official store on Taobao, China's e-commerce giant. The hoodie Gavin wore that day is listed for 288 yuan ($42.5), and a smart phone case costs 48 yuan. The store has been followed by more than 31,000 users. His Chinese fans called Gavin their "e'zi," a funny way to say "er'zi," meaning "son" in Chinese. Joanna, 19, a student from Beijing Sport University, is a huge fan of Gavin. She told the Global Times that she fell in love with Gavin's smile the first time his pictures went viral on Chinese media. "I even used a VPN to collect Gavin's images and emojis from Instagram," Joanna said, showing the photo album on her phone, full of pictures of Gavin with different expressions. Joanna first met Gavin in person when he came to Beijing in August 2018. She stood beside Gavin when taking a group picture, which is now her profile picture. Joanna said she loves Gavin not only because of his smile, but also because he is the cutest little boy she has ever met. Talking about Gavin's increasing popularity in China and his frequent appearances in China, Joanna said that she is a little worried for the child. She said that she did not want the sudden fame to affect Gavin's ability to grow up as a happy boy. "There is no need for him to make his fake smile every time a camera captures him. He should grow up happily as a normal boy," Joanna said. The day after the fan meeting, Gavin attended the "Night of Weibo," an annual festival that brings together influential celebrities, both from online and offline. He was invited to take selfies with many stars, including Wang Yuan, Chinese pop singer from TFBoys, and Wang Sicong, the son of Chinese billionaire Wang Jianlin. The photo with Wang Yuan was reposted over 1.2 million times. However, a picture of Gavin falling asleep on a chair at the festival also sparked discussion, with many of Gavin's fans feeling bad for the tired boy. "He travelled all the way to China and 'smiled fakely' for two days. I only hope he can be happy, no matter if he is a superstar or not," a netizen said. "A 'fake smile' is actually an attitude," said Shi Wenxue, a Beijing-based cultural critic. "The embarrassed but polite smile has become a way to express irony to oneself or others on the Chinese internet." "However, if the boy is overexploited and over-consumed, the original emotion and mood will be lost," Shi noted. 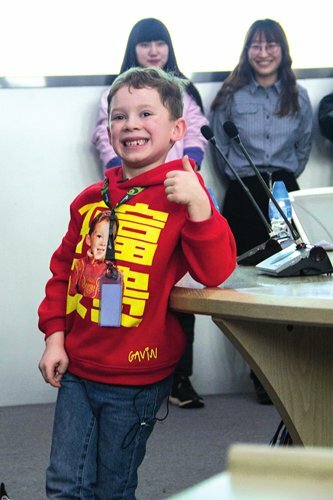 After a day of meeting fans and attending the festival, Gavin climbed the Great Wall the next day and played with Nerf guns and video games, which Chinese netizens said made Gavin finally put on a "real smile."